Jacobs thread mounted chucks feature jaws center-ground for absolute straightness and alignment and a one-piece sleeve that eliminates cracks between driving teeth often found in other designs. Jacobs thread mounted chucks feature through-hardened sleeve teeth, plus hardened nose and keyholes provide outstanding wear resistance. Each chuck 100% inspected for performance and precision. T.I.R. .004'' maximum at half capacity. The 6314D Jacobs Thread Mounted Chuck, Heavy Duty is one of thousands of quality tooling products available from MRO Tools. 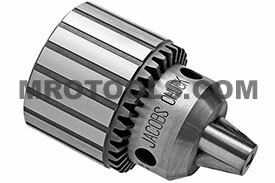 Please browse Jacobs Thread Mounted Chucks, Heavy Duty for tools similar to the 6314D Jacobs Thread Mounted Chuck, Heavy Duty. 6314D Jacobs Thread Mounted Chuck, Heavy Duty description summary: Jacobs thread mounted chuck, heavy duty. Chuck Size: 3/4'' Model Number: 36B 5/8 Minimum Capacity: 0.188'' Maximum Capacity: 0.800'' Mount: 5/8''-16 Key Number: K4 Closed Length: 4.12'' Open Length: 3.20'' Sleeve Diameter: 2.54'' Quantity discounts may be available for the 6314D Jacobs Thread Mounted Chuck, Heavy Duty. Please contact MRO Tools for details.